Many people have wondered whether there’s intelligent life on other planets (and even more have wondered whether there’s any on Earth). The popularity of The X Files over the years and countless movies about alien invasions has proved our appetite for extra-terrestrials never wanes, and so it’s no surprise that slots developers have traditionally fed off this love of all things Martian. Area 21 or Area 51? 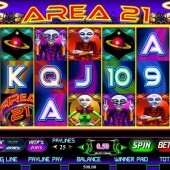 Slot developer Amaya celebration of little green men – Area 21 – is obviously inspired by the legendary site of Area 51 in the Nevada desert where a UFO was supposed to have crashed in the late 1940s. If Area 21 is anything to go by, those aliens definitely did crash and probably ended up in another equally legendary Nevada hot spot, Las Vegas. The slots is packed with garish colors and happy-go-lucky aliens dressed in all manner of wacky clothing. There are three aliens (the top payer the female alien who pays out a 1,000-coin jackpot when five are hit across the reels) as well as their home planet and 9-through-Ace symbols on the reels. The obvious Wild icons is Wild, and it substitutes for all symbols on the game other than the Scatters. Five Wilds pays out a 2,000-coin jackpot. There’s a spot of Vegas for anyone hitting three or more Area 21 Scatters across the reels. Do that and you’ll win Blackjack Free Spins where you get to play a hand of everyone’s favorite table game against the alien dealer. If you know the game you’ll know what happens: you and the dealer receive two cards each – if you beat the dealer’s total you win; go over a total of 21 and you lose. Depending on what happens in the hand of Blackjack, various free spins will be awarded: if you lose you win 10 spins with a 2x multiplier; if you win, you’ll win 10 spins with a 3x multiplier. However, if you’re dealt a natural blackjack (e.g. A-J for a total of 21) you’ll win yourself 25 free spins with a 5x multiplier. Spins can be re-triggered during the bonus round by hitting three further Scatters on the reels. Online slots offering an element of skill are creeping in these days. Whether it’s a straight ‘battle’ fight round or a target shooting game, it’s good to see something a little different other than the usual ‘Pick ‘em’ or ‘Instant Win’ bonuses. It’s all the better if you’re even vaguely used to the rules of blackjack. 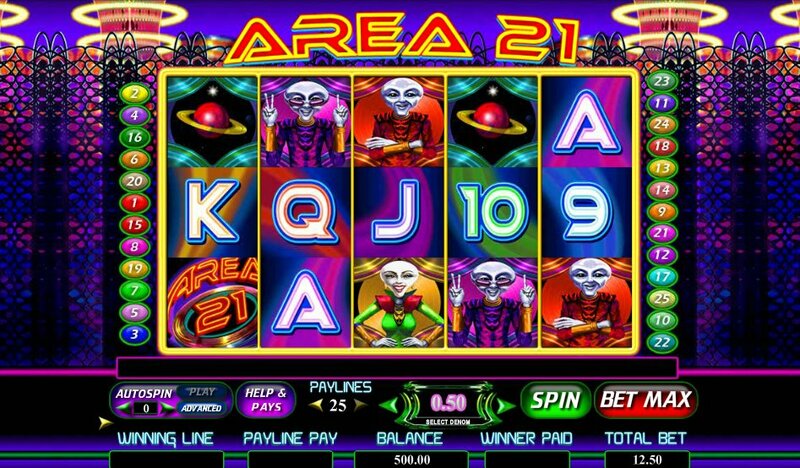 A unique bonus round and the potential for big bonus wins makes Area 21 worth an investigation; as for other UFO-related thrills on the reels, check out BetSoft Gaming’s 3D sci fi-themed slot, Out of This World, while iSoftBet’s cartoony Area 51 is a good alternative, particularly as it carries a whopping $200,000 jackpot.